High Impact Practice:Keep girls in school to promote health and development. Investments that promote keeping girls in school, particularly in secondary school, have far-reaching and long-term health and development benefits for individuals, families, and communities. Data consistently demonstrate a strong and positive relationship between increased formal educational attainment among girls and healthier sexual and reproductive behaviors, including contraceptive use (DHS Program, 2012; Lloyd, 2005; Mboup and Saha, 1998). Educating girls helps improve gender equity by increasing agency and empowering girls to engage in decision-making that affects their families and the development of their communities. Benefits of girls’ education extend beyond individual achievement to influence household economics. On average, for every additional year of education, an individual’s wages increase by an estimated 10% (EFA Global Monitoring Report team, 2014). Access to high-quality contraceptive services for young people plays a key role in helping girls avoid an unintended pregnancy in order to pursue their educational goals. Describing program approaches that allow young men and women to access and use contraception effectively is outside the scope of this document. The purpose of this brief is to describe the relationship of girls’ education on family planning and reproductive health and behaviors; highlight evidence-based practices that increase girls’ enrollment, retention, and participation in school; and provide recommendations for how the health sector can help support keeping girls in school. Many girls and boys continue to miss out on the potential benefits of school. 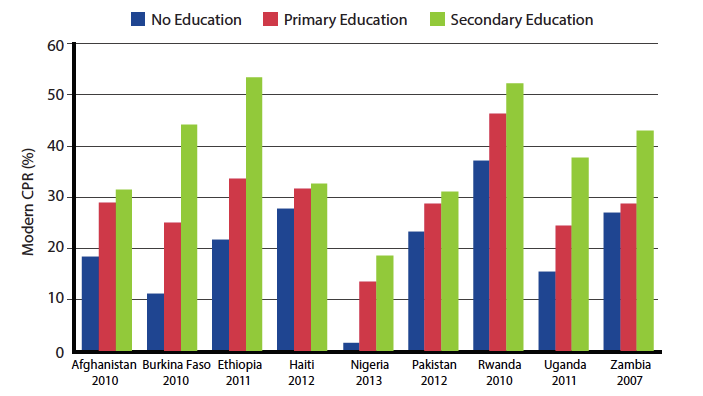 In 2011, 57 million children globally were not in school. More than one-half of the world’s out-of-school children live in sub-Saharan Africa (EFA Global Monitoring Report team, 2014). Although gender disparities in education are narrowing, UNESCO estimates that only 29% of primary-school-age children live in countries that have achieved gender parity (that is, equal participation for girls and boys in school) at the lower secondary level, and only 15% live in countries with gender parity at the upper secondary level (Fiske, 2012). Governments and their partners can invest in structural changes that facilitate access to formal education, such as equitable gender norms, economic empowerment, and promoting healthy behaviors. Supporting girls to stay in school through the secondary level is one of several “high-impact practices in family planning” (HIPs) identified by a technical advisory group of international experts. When scaled up and institutionalized, HIPs aim to maximize investments in a comprehensive family planning strategy (HIPs, 2013). For more information about other HIPs, see http://www.fphighimpactpractices.org/overview. Although the relationship between educational attainment and sexual and reproductive health behaviors and outcomes is complex and bidirectional, strong associations between education and reproductive behavior are observed consistently across a wide variety of social and economic settings and over time. Educated women are more likely to delay marriage and first births as well as engage in other protective health behaviors. Research in developing countries shows that girls who attend formal school delay sexual initiation, marry and start childbearing at older ages, and have lower rates of HIV and other reproductive morbidities (Lloyd, 2005). A review of risk and protective factors among adolescents found that greater educational attainment was associated with delayed sexual initiation and increased likelihood of contraceptive use, including condoms (Mmari and Sabherwal, 2013). Women’s education is associated with a wide range of positive child health outcomes. Researchers estimate that over 50% of the reduction in child deaths between 1970 and 2009 could be attributed to increased educational attainment in women of reproductive age (Gakidou et al., 2010). Each additional year of mothers’ education increases the chance of mothers using prenatal care (Currie and Moretti, 2003). Children of educated mothers are more likely than children of uneducated mothers to have higher birth weights, less likely to die in infancy, and more likely to be immunized (Muula et al., 2011; Chou et al., 2007). These relationships are observed among mothers with primary-level education and become stronger with secondary-level education (Chou et al., 2007). Complementary investments in education and family planning can accelerate the fertility transition and facilitate development. A study analyzing long-term trends between education and the fertility transition concluded that “on average, countries with a higher level of education tended to be more advanced and to have earlier emergence of modern contraceptive use … and therefore to have an earlier fertility decline” (Garenne, 2012). A demographic projection model using data from India predicted that investments in both education and family planning programs will have the largest impacts on slowing population growth compared with investing in only one aspect, and that together these investments will have far-reaching effects on gender equity and economic growth (Jiang and Hardee, 2014). Based on data from 105 countries, researchers concluded that investments in universal primary and secondary education played a “decisive role” in bringing countries out of poverty and reducing fertility rates (Crespo et al., 2013). Educated women are more likely to have fewer children and to use modern contraception. Research consistently shows a strong correlation between women’s higher educational attainment and increased contraceptive use and reduced childbearing. In countries with large differences in educational attainment, women with no education will bear, on average, up to 3 children more in their lifetime than women with secondary or higher levels of education (Asiimwe et al., 2013; DHS Program, 2012; Mboup and Saha, 1998). Similarly, in these countries, levels of modern contraceptive use are 30% to 700% higher among women with primary or secondary education than among women with no education (see Figure). What Works to Keep Girls in School? Engage communities to change social norms that devalue girls and their education. In a study of seven African countries, nearly half of all surveyed parents believed there are certain disadvantages to schooling girls (Fancy et al., 2012). Lack of social support discourages girls from attending school, such as staff providing more support to boys than girls; teachers believing that subjects such as math are less important for girls than boys; harassment by boys; and boys not recognizing that girls are not treated equitably (Lloyd et al., 2000). Community engagement approaches can address these barriers by emphasizing the value of girls and the benefits of girls’ education; promoting a gender-equitable distribution of household work; engaging parents, girls, and communities to ensure girls’ safety; and providing a support structure for girls to pursue education. Improve the quality of the school environment. In many countries, children do not attend school because they fear an environment of abuse and sexual exploitation. For example, in Ghana and Senegal, 75% and 80% of children, respectively, cited teachers as the main perpetrators of violence in school (Fancy et al., 2012). Teacher training, engaging in collaborative learning styles and extracurricular activities, employing women as teachers, appointing women to local positions of leadership, and community engagement approaches can help improve the quality of schools (Unterhalter et al., 2014). Provide economic incentives to enroll and keep girls in schools. In sub-Saharan Africa, over half of surveyed parents said they did not enroll their children in school due to a lack of financial means, despite the existence of free basic education (Fancy et al., 2012). A situation analysis in four Asian countries found that direct and indirect costs of school were the main cause for dropouts (USAID, 2014). Much of the rigorous evidence on keeping girls in school comes from interventions that involve economic incentives, such as such as conditional and unconditional cash transfers or non-cash transfers to cover expenses such as school fees, books, uniforms, and transportation (Unterhalter et al., 2014). Data show that conditional cash transfers based upon school attendance are effective at increasing school enrollment and attendance among girls in secondary school (Baird et al., 2010). Program beneficiaries were 3–4 times more likely to be in school after 1 year than individuals in the control group. For program beneficiaries who were out of school at baseline, the probability of getting married and becoming pregnant declined by more than 40% and 30%, respectively. Among all beneficiaries, onset of sexual activity was delayed and risky behaviors were reduced. non-conditional cash transfer of US$20/month. OVCs in 14 additional locations served as the control group. OVCs by 31%, with greater impact among females (42%) than males (26%), possibly by keeping young people in school. Secondary-school-aged children in program households were 8 percentage points more likely to be enrolled in school than those in the control group. After 2 years, school dropout was reduced by 82% and marriage by 63% among the intervention group. Link health programs to schools. High levels of poverty affect both boys’ and girls’ health status and nutrition and have impact on school attendance (Fancy et al., 2012). By addressing the underlying health issues that affect school attendance school-feeding programs, such as the BESO II, Community-School Partnership Program for Education and Health in Ethiopia (Tate et al., 2011), the World Food Program in Pakistan (WFP, ) and school deworming programs in Kenya (Miguel and Kremer, 2004) have been effective at reducing absenteeism and increasing primary school enrollment. Separate toilets for girls at schools (Birdthistle et al., 2011; Unterhalter et al., 2014). Menstrual hygiene management (Sumpter et al., 2014; Unterhalter et al., 2014). How Can the Health Sector Support Keeping Girls in School? Many of the following considerations include cross-sectoral approaches between the health, education, and other sectors. Cross-Sectoral Monitoring and Evaluation. The impact of education interventions on sexual and reproductive health behaviors remains complex and the mechanisms of action unclear. Collaborative efforts to keep girls in school should collect key information on inputs, outcomes, and cost-effectiveness for both education and sexual and reproductive health. Community Engagement. These interventions were the most effective when they engaged a wide range of stakeholders, including teachers, supervisors, students, ministry officials, and parents/guardians (Clarke, 2011; Tate et al., 2011; Herz and Sperling, 2004). Many health sector programs have existing community structures such as community-based distribution agents and community health workers. The health sector can use these structures to strengthen social and behavior change communication strategies in order to address community perceptions of school quality and safety as well as gender roles. These strategies should coordinate messaging and link messages on the mutual benefits of education on health, including sexual and reproductive health, and vice versa. Economic Incentives. Targeted resources to parents and/or students, in the form of stipends and cash transfers, improve girls’ access to school as well as their retention and progression in school. In poor settings, even small amounts of cash may be sufficient to significantly increase participation of girls in school (Unterhalter et al., 2014). The health sector can partner with the education and other sectors to support such cash and non-cash transfers. Identifying the appropriate beneficiaries is a critical factor in the effectiveness of these interventions. Resources should be directed to the populations most in need and to students at grade levels where dropouts are most likely to occur. Another important aspect of targeting the resources is to ensure eligibility criteria are transparent, objective, well-understood by communities, and perceived to be fair (Unterhalter et al., 2014). Conditionality enhances impact on school attendance but increases cost. Impact is greatest if focused on girls at points of transition in the education system. Gains are greatest in the poorest settings and among the poorest girls. School accessibility can constrain impact. Enrollment and attendance gains do not necessarily translate into improvements in learning outcomes. Cost-benefit ratio should be included in any analysis of conditional cash transfers. Safety to and from school should be addressed. This document was written by Shegufta Shefa Sikder, Shawn Malarcher, Shannon Taylor, and Maryce Ramsey. Critical review and helpful comments were provided by Avni Amin, Michal Avni, Monica Bautista, Christine Beggs, Doortje Braeken, Clarissa Brundage, Sylvia Cabus, Christine Capacci, Satvika Chalasani, Peggy D’Adamo, Ellen Eiseman, Leah Freij, Jennifer Friedman, Michelle Gamber, Victoria Graham, Rena Greifinger, Margaret Greene, Sarah Henry, Joan Kraft, Catherine Lane, Shiela Machuria, Liz Martin, Erin Mielke, Chandra Mouli, Madhuri Narayanan, Constance Newman, Chelsea Polis, Suzanne Reier, Marcella Rueda, Diana Santillan, Janet Shriberg, Shelley Snyder, Marni Sommer, Jeff Spieler, Patricia Stephenson, Linda Sussman, Joar Svanemyr, Julie Swanson, Nandita Thatte, John Townsend, Ann Warner, and Sylvia Wong. This HIP brief is endorsed by: Abt Associates, Bill & Melinda Gates Foundation, Chemonics, EngenderHealth, FHI360, Futures Group, Georgetown University/Institute for Reproductive Health, International Planned Parenthood Federation, IntraHealth International, Jhpiego, John Snow, Inc., Johns Hopkins Bloomberg School of Public Health Center for Communication Programs, Management Sciences for Health, Marie Stopes International, PATH, Pathfinder International, PLAN, Population Council, Population Reference Bureau, Population Services International, Save the Children, United Nations Population Fund, and the U.S. Agency for International Development. The World Health Organization/Department of Reproductive Health and Research has contributed to the development of the technical content of this brief, which is viewed as a summary of evidence and field experience. It is intended that this brief be used in conjunction with WHO Family Planning Tools and Guidelines: http://www.who.int/topics/family_planning/en/.